This post will show you how to add peak properties table and tag peak indices in graph created after peak deconvolution. We have put together an Origin Project (OPJ) Peak_Deconvolution_with_Peak_Properties_Table.zip (23.9KB) file, you can download this OPJ file to learn how to do this. 1. 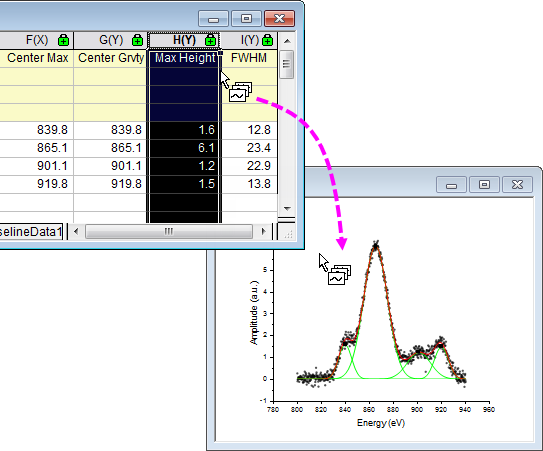 Open the opj file and click on Graph1 to activate the window. 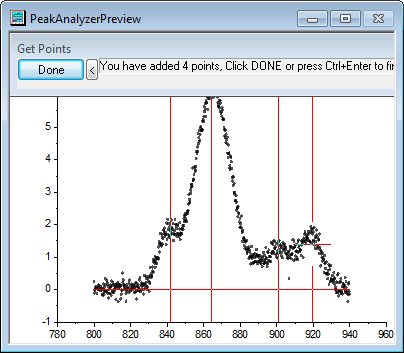 Choose Analysis: Peaks and Baseline: Peak Analyzer from menu to open dialog. 2. Select Fit Peaks(Pro) as Goal and click Next button. 3. Check Custom radio box under Constant node and input 0 in Y= edit box. double click 4 times around each of the four peak positions to add peaks for fitting. 5. Click Done in Get Points dialog to exit. Click Next button to go to Fit Peaks (Pro) page. 6. Expand Configure Graph subnode under Result node and select <Source Graph> as Create Report Graph drop-down list. 7. Click Finish button and you will see the independent and cumulative fitting curves are added to source graph. 8. Select legend and delete it. 1. Activate the source workbook, and go to PeakProperties1 sheet. 2. Set column Center Max (Long Name) as X column. Highlight column Max Height (Long Name), place mouse cursor over its right edge till cursor icon changes as follows and drag-and-drop the selection to source graph and release the mouse. 3. It will add scatter plot with X, Y coordinates of each peak. 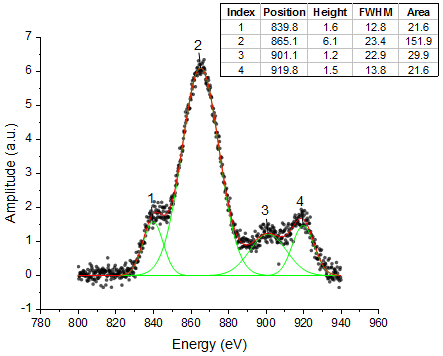 Double click on source graph to open Plot Details dialog, expand Layer1 node on left panel and highlight [Book1]PeakProperties1!F(X),H(Y)[1*.4*]. 4. Go to Symbol tab on right panel and set symbol Size to be 0 to hide the symbol.Then go to Label tab, check Enable checkbox and then click Label From drop-down to select Col(A):”Peak Index” as peak label. 5. Select Above as Position drop-down list and check Show Leader Line if Offset Exceeds (%) checkbox in Leader Line group. 6. Click OK button to exit. We can see peak indices are added to source graph, click on any symbol and drag it up to reposition it properly. Note: If you drag it beyound the layer frame. Labels may be clipped. Go to Plot Details dialog again. Select Layer1 on the left and go to Display tab. Uncheck Clip Data to Frame checkbox. The label beyond the layer frame will show. Suppose now we only want to know the peak center, peak height, peak FWHM and peak integration area of each peak. We can table these properties and place it on source graph. 1. 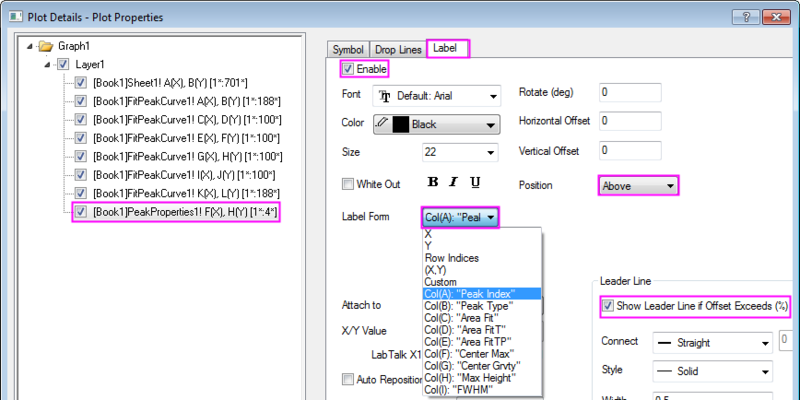 With PeakProperties1 sheet active, hold Ctrl key to select column Peak Index, Area FitT, Center Max, Max Height, FWHM (Long Name) and right click to select Copy: Copy. 2. Go to source graph, right click on the graph to select Paste and a table is added to the graph. Tip: Since Origin 2016, the results table will also be automatically outputted to source graph so that you will not need to manually copy it over. 3. To customize the table, double click it to expand. Highlight whole table and click toolbar buttons to center the text horizontally and vertically. 4. Insert a label row, input labels as shown below and make the labels bold. 5. Highlight column Area and right click to select Move Columns: Move to Last. 6. Click Update Table button on top left corner to update it and click collapse button on top right corner to exit. To set number of decimals or digits shown in table, you can go to menu Tools: Options to open Options dialog. Go to Numeric Format tab, and check desired radio box (Decimal Digits/Significant Digits) and set Number of Digits. Thank you for this, I’ve just applied it to a bunch of emission spectra and the information makes for much better presentation.